0.6 oz / 17.75 ml $12.71 ORGANIC. 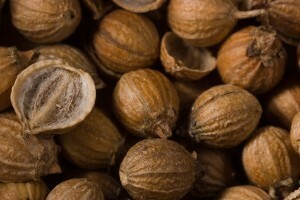 PART OF PLANT – Coriander seeds. EXTRACTION – Steam distillation of crushed seeds. STIMULATES ESTROGEN PRODUCTION – useful in conditions requiring natural estrogen – such as increasing fertility, or decreasing menstrual cramps. DIGESTIVE CALMER – Eases indigestion / gas / digestive spasm. A WARMING OIL – Reduces aches of arthritis, rheumatism and muscular tension. SPECIAL – Purifies the blood of toxins and wastes. PRECAUTIONS – Do not use if you are pregnant.